Ever fancy having authentic Indian food, but don’t want your local or a meal from Brick Lane’s intense high street? Here’s where Dishoom comes in. The Bombay-styled restaurant has locations in Covent Garden, Carnaby St, Kings Cross and Shoreditch as well as a a new spot opening in Liverpool soon. The restaurant comes into play if you really fancy something different from your local. 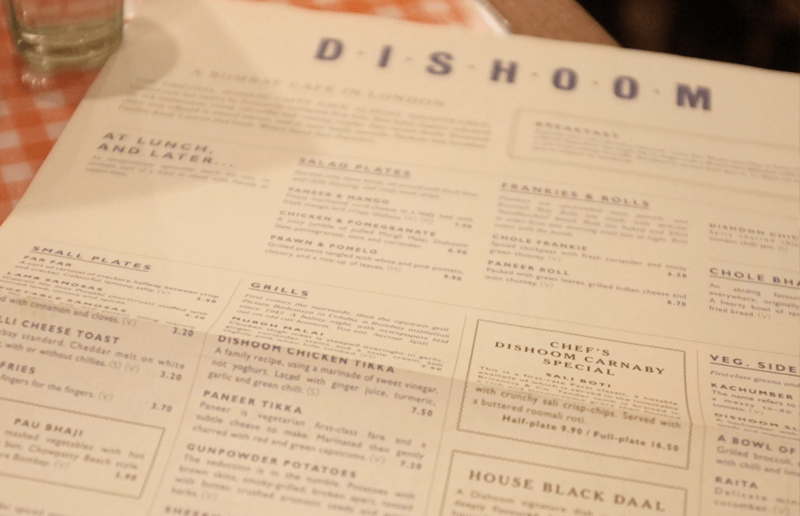 Take a tapas bar and infuse it with Indian – and you’ll be closer to what Dishoom is. As you enter, you’ll see the black and white tiled floors and marble tabletops as well as a great cocktail bar which you can sit as whilst waiting for your table. 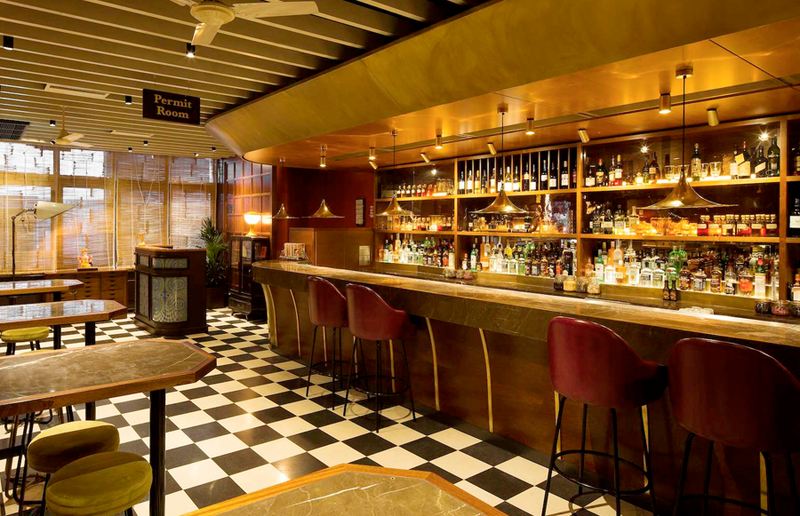 Dishoom’s interiors echo colonial times of the British Raj, telling the story of Old Bombay. There’s grey banquettes and slabs of oak panelling alongside vintage Bollywood-style adverts, and authentic music being played out to the busy venue. Once seated, we began trying to work out what to order. The menu, printed on thin crisp aged paper has a wide array of plates. You won’t spot a Korma or Chicken Tikka Masala here, however. Bombay food is very different from your typical Indian. It’s more naan and tikka, than curry and rice. There are no starters available, but the sizeable list of ‘smaller plates’ are great accompaniments to the larger meat and fish dishes. We tried out the lamb samosas, gujarati filo stuffed with minced lamb, onions and spices for £4.90, and the Okra Fries at £4.20. 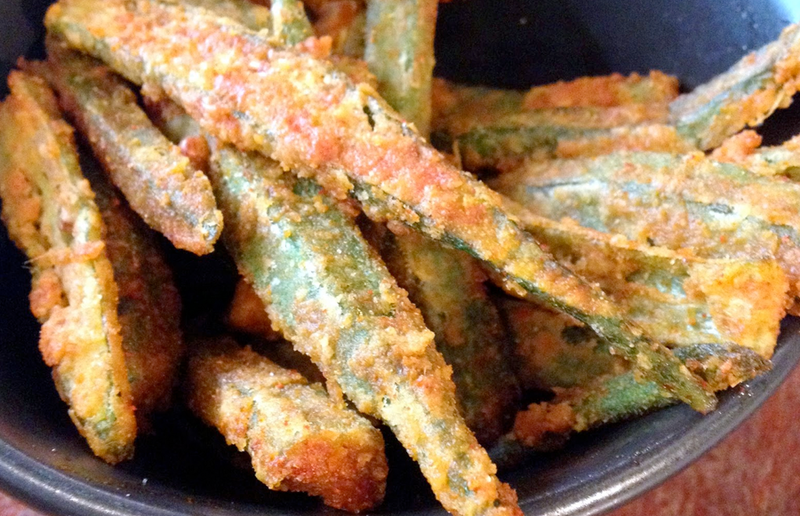 Full of flavour, and a great starter to the meal. 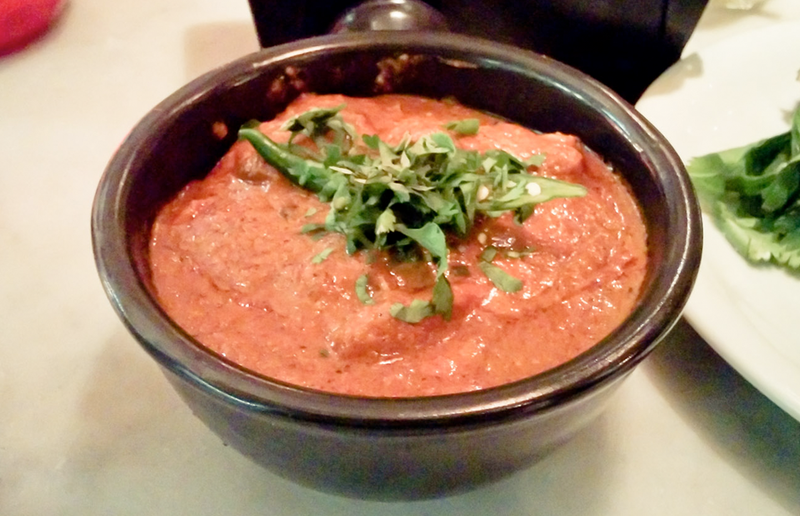 After, we shared a number of plates with our table, but some of our favourite picks were the Murgh Malai, chicken thigh meat steeped overnight in garlic, ginger, coriander stems and a little cream for £7.90. As well as the Dishoom Chicken Tikka which is a family recipe, using a marinade of sweet vinegar, not yoghurt. Laced with ginger juice, turmeric, garlic and green chilli for £7.90. It’s also worth trying the Dishoom Calamari, tiny tender squid, grainy crumb crunch, quick-fried and tossed into a bowl with Dishoom drizzle for £5.90 and the gorgeous Black House Daal, which was my personal favourite. The signature dish is dark, rich and deeply flavoured. It is simmered over 24 hours for extra harmony coming in at £5.90. Drinks wise, there’s a selection of beers gin-based cocktails and wines on the menu. However, we went for a non-alcoholic cocktail, the Passionfruit Sharbat dashed with rum, of course. The drink is mixed with passionfruit and lime, finished with a generous splash of soda, without the rum it’s £3.90. I’d also recommend the Kingfisher Beer, which comes in a small or large – with the large big enough to share between two. It’s £6.70 for the larger bottle. On the menu is also details of their Magic Breakfast partnership. A charity aiming to end hunger as a barrier to education by providing nutritious breakfasts to its partner schools. For each and every breakfast you eat at Dishoom, they donate a ‘magic’ breakfast to a school in London. A meal for a meal. As of the end of March 2016 – they’ve donated 154,934 ‘magic’ breakfasts to fuel children’s learning.